Xabi Alonso is currently experiencing, for the first time it has to be said, the full force of FC Bayern’s emotional rollercoaster. When the sun is shining and FC Bayern are dominating their opponents, everything is rosy and players briefly earn legendary status. However, when the results are less than ideal, fans and media alike feel the need to satisfy their innate human need of finding a scapegoat. When Xabi Alonso missed the Hamburger SV humiliation (Bayern won 8-0) and then got sent off in the following match of a rather boring scoreless draw against Shakhtar Donetsk in the UEFA Champions League, he had brewed the exact ingredients for the scapegoat concoction. Of the same mould as Pirlo? Xabi Alonso is a player of the same mould as Andrea Pirlo. Never quick on the ball, he has the presence and the vision to spray delightful passes to his teammates. The fact that his game is not based on speed gives Xabi Alonso, who turned 33 in November, quite some time until he can hang up his boots, something that Pirlo who’s 2½ years his senior still hasn’t done. The problem is that players of his make need someone to complement them athletically. Back in his Liverpool days, Xabi Alonso formed a formidable partnership with local hero Steven Gerrard. Back then, Xabi Alonso was indeed a bit faster. At the same time, Gerrard of that age was faster than Schweinsteiger is now. To make matters worse, the game is also a lot faster now. Therefore, the importance of complementing slower players is a lot more important now. Pirlo is surrounded by Vidal and Pogba; Xabi Alonso is being partnered with Schweinsteiger. 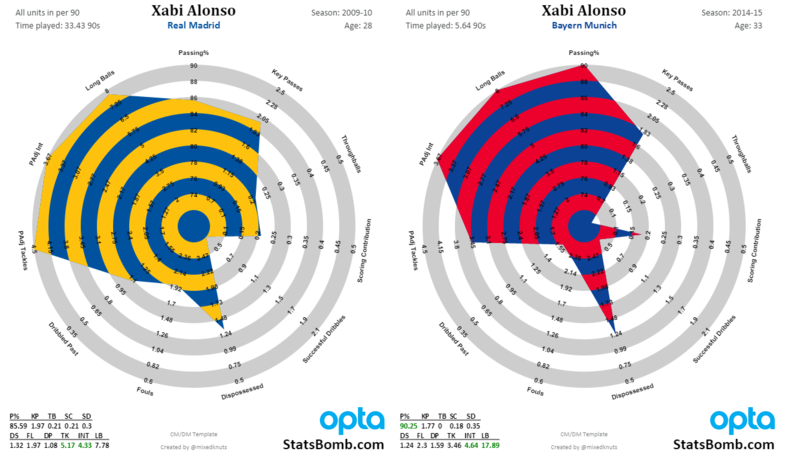 The problem does not lie with Xabi Alonso being slow; rather, it’s that both Xabi Alonso and Schweinsteiger are slow. While Schweinsteiger was out injured, Xabi Alonso excelled. When Xabi Alonso was out injured, Schweinsteiger helped Bayern Munich’s hammering of Hamburg. Yet, when both of them played, the faster wingers found themselves having to play a bit more centrally in order to make up for the speed deficiency along the centre of the field. Xabi Alonso is not old. Well, he is, but he’s got quite some fuel left in his tank. Thing is, he’s in a bit of a situation now. In approximately a month’s time, the competition in midfield will become a whole lot tougher with both Lahm and Thiago coming back from long-term injuries; both of them are preferred by Guardiola and able to play faster than either Xabi Alonso or Schweinsteiger. Thus, there will really be only one place on the field, if any, for Xabi Alonso or Schweinsteiger. Given the legendary status that Fußballgott currently enjoys at the club, there can only really be one loser. Rather than enjoying the swansong to his great career, Xabi Alonso could be looking at some serious time on the bench. With a lot left to offer he’s set to be the victim of the situation at FC Bayern. Credits to @LWOS_Mary for inspiring the heading of the article. We will see the benefit of having an experienced leader like Xabi soon enough. I’d also like to add that Bundesliga is in an entirely different pace as in La Liga and Serie A (where older midfielders can thrive). Sitting out just what two games since he joined us, the speed of the game here has probably taken effect on his body this 2nd half of the season. And he’s really been man-marked by two players ever since the game against BVB. Wolfsburg did it brilliantly and Moscow also used their two strikers to stay close to him and press him. Good point regarding the speed of the leagues, though I’d dare say that La Liga is improving in this respect. In the Bundesliga, he got a kicker match rating of 2 (1 being the highest) against Paderborn (4-0), Stuttgart (2-0) and Bremen (6-0), all whilst Schweinsteiger wasn’t playing. In the Pokal, he played only 1 match, against Hamburg, and he assisted 2 out of 3 Bayern goals. In the Champions League, we won all matches while Schweinsteiger was out. We were also winning in the 2nd match against Man City, but when Guardiola put Schweinsteiger on in the 81st minute playing alongside Xabi Alonso, Bayern conceded in the 85th and 90th minutes. Welcome back to golden times, Alonso!